A 46-year-old road construction worker died from injuries sustained when he was run over by a dump truck. The man was part of a three-person surveying team that was cross sectioning part of a road that was being upgraded. The worker was installing wooden stakes in the road-bed to record elevations being radioed to him by a technician using a surveying level. He knelt beside the stake in the middle of the road to record the measurement, unaware that a dump-truck was backing toward him. With his back turned to the truck, he neither saw nor heard it bearing down on him; in his kneeling position he was invisible to the driver. He was run down by the dump truck, and pronounced dead on the spot. Investigating officers noted that the truck was equipped with a back-up alarm, which was determined to be in good working order. Before starting a road construction project, the contractor must determine if there is a danger of employees getting run down, and establish a procedure that will eliminate the possibility. Employees must not be assigned to work in the path of moving equipment, and contractors are advised to establish a reasonable safety zone between machines and workers. Employers are responsible for co-ordinating the work activities so that neither vehicular traffic nor road-building equipment pose a threat to employee safety. 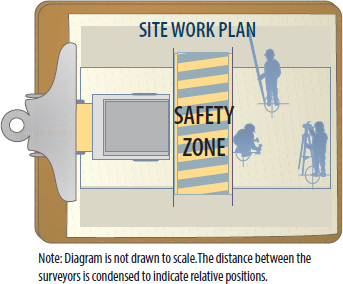 Establish a safety zone appropriate to the work plan to ensure that work crews don’t intrude upon, or conflict with, each other’s activities. In this case, a safety zone would have prevented the worker from being anywhere near mobile powered equipment and a life would have been saved. Employers are required by law to take every reasonable precaution to ensure the health and safety of their workers.